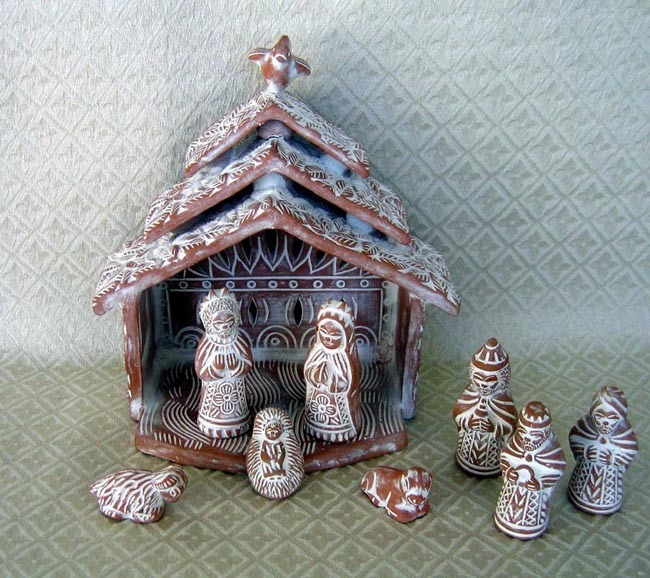 This Nativity with elaborate stable is made from whitewashed terra cotta. The stable houses Mary, Joseph, Jesus, three wise men, a cow and a ram. The stable measures 8 inches long by 8 inches high by 4.5 inches deep. The tallest figure is 3.5 inches high. This item is made by CORR (Christian Organization for Relief and Rehabilitation), which gives rural women in Bangladesh the option of staying home with their children and still earning supplemental income for their families. The 4,200 women artisans, who are members of 214 rural cooperatives, produce jute and ceramic products in between household chores and family responsibilities. Fruit and timber saplings are provided to producers to ensure the regeneration of scarce fuel resources and to provide food. CORR has changed the lives of many destitute rural women.